The EU Multi Annual Financial Framework (MFF) post 2020 will define the Union’s financial means to address societal, economic and environmental challenges for the next 7 years. Therefore, the MFF is a unique opportunity for the EU to demonstrate coherence with its long-term energy and climate objectives and a serious engagement to deliver tangible benefits to European citizens. Our business community considers the MFF as the framework that can outline the much-needed long term political direction for private investors. Public EU funds are not sufficient to finance the energy transition. 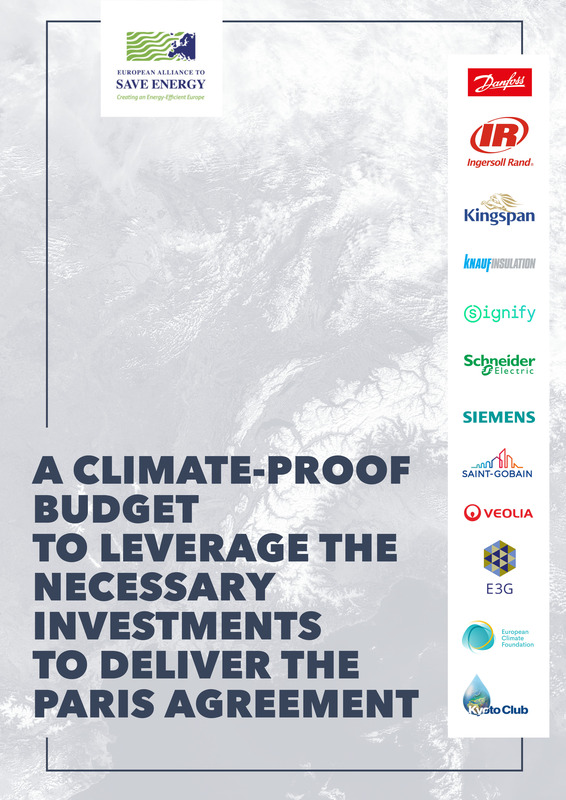 According to a recent report commissioned by the European Commission, the EU budget contribution to mitigation finance covers as little as 5-7% of the total resource required. However, the MFF has an important signaling and leveraging role to play to attract private investments necessary to fill the gap. The investments in clean technologies and in particular in cost-efficient energy efficiency projects will be unlocked only if the EU provides long term certainty to the private sector. The present paper is the contribution of a cross-sectoral alliance of businesses on the current discussion concerning the overall MFF proposal and the related sectorial funding instruments. Several of MFF sectoral legislative proposals, such as Cohesion Policy (CP), Connecting Europe Facility (CEF), Horizon Europe and InvestEU, have a significant impact in sectors like energy, buildings and transport – which are major sources of GHG emissions. These funding instruments, if correctly designed, can drive growth and jobs across the EU. They can mobilize private investments in areas with high mitigation potential, such as energy efficiency, and be catalysts in the fight against climate change and the transition to a net zero carbon economy.